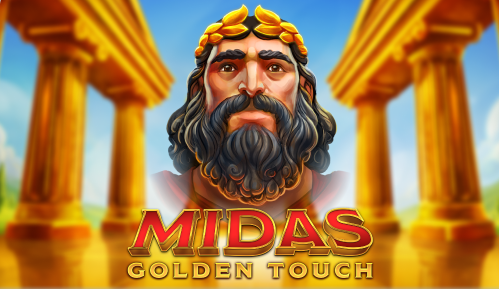 Midas Golden Touch is the latest online slot game from Thunderkick. This game, which uses 15 lines, comes with an old Greek mythology theme around King Midas turning everything to gold. And of course with all Thunderkick slot games, the graphics are amazing. All symbols, including wild symbols, may appear double and triple stacked on all reels. Winning combinations that contain one or more wild symbols will be multiplied. The more wild symbols in a winning combination, the bigger the multiplier. The multipliers are x2, x4, x8, x16 and x32 when you have 1, 2, 3, 4 or 5 wilds respectively. 3, 4 or 5 scatter symbols will reward 10, 15 or 20 free spins respectively. During free spins one random wild symbol is placed on the reels during each spin. The free spins feature also features a re-spin feature. When you get a winning combination, all winning symbols are held and the rest of the reels will spin. As long as more winning symbols appear, you will get another re-spin. Re-spins will stop when no more winning symbols appear. Scatter symbols are also accumulated during one of those re-spins. When you have collected three you will get another 10 free spins. Midas Golden Touch is a great online slot game. It can really pay big, especially during those re-spins. Thunderkick slot games always play very smooth and Midas Golden Touch is no different. This new game is now available at Casumo, but in a couple of days more online casinos will add this game. Play Midas Golden Touch now for free or for real at Casumo.